Sgt. Gay was promoted to Lieutenant in November 1864 and finally to Captain in August 1865. His brother, Alonzo Gay (1838-Aft1930), also served with Leonard in the 1st New Hampshire Infantry and the 4th New Hampshire Infantry. Their brother, Charles — to whom most all of these letters were addressed — was a farmer in Nashua, New Hampshire. [Charles, like Leonard and Alonzo, also served in the 1st New Hampshire Infantry.] I believe these three brothers were the sons of Charles S. Gay (1814-1858) who resided in Nashua during the 1830’s and 40’s but relocated to South Point, Missouri prior to his death on 24 April 1858. Since Leonard never mentions his mother, I presume she had died prior to the war like his father, leaving him and his siblings orphaned. In the 1860 Census, Leonard is enumerated in the household of Nashua mason, Charles W. Morrow (b. 1831) and his wife Eveline M. (b. 1830). Leonard’s occupation is given as “engineer.” Residing with him were his brother Charles Gay (b. 1835), Leonard’s wife, Ann T. Kellogg, and their 5 month old son, Elon Rolando Gay (1860-1944). Despite an infant at home, Ann’s occupation is given as “factory worker.” In the 1880 Census, Leonard is enumerated in Nashua with his wife Ann and 20 year-old son, Elon Rolando Gay. It seems Elon was deaf. In the New Hampshire Patriot and State Gazette (Concord, NH) issue of 3 July 1872, “Elon R. Gay of Nashua” is listed among the 16 males from New Hampshire attending the American Asylum for the “Deaf & Dumb” at Hartford, Connecticut. [Elon married Hannah C. Boothby in 1881.] Leonard’s pension record indicates he died on 14 May 1914 at Hudson, New Hampshire. The regiment was attached to Casey’s Provisional Brigade, Army of the Potomac, October 1861. Wright’s 3rd Brigade, Sherman’s South Carolina Expeditionary Corps to March 1862. District of Florida, Department of the South, to September 1862. Brannan’s Brigade, District of Beaufort, South Carolina, X Corps, Department of the South, to April 1863. United States Forces, Folly Island, South Carolina, X Corps to June 1863. 1st Brigade, United States Forces, Folly Island, South Carolina, to July 1863. 1st Brigade, 1st Division, Morris Island, South Carolina, X Corps, July 1863. 1st Brigade, Morris Island, South Carolina, to January 1864. District of Beaufort, South Carolina, to February 1864. Foster’s Brigade, Dodge’s Division, District of Florida, February 1864. District of Beaufort, South Carolina, to April 1864. 1st Brigade, 3rd Division, X Corps, Army of the James, Department of Virginia and North Carolina, to May 1864. 3rd Brigade, 3rd Division, XVIII Corps, Army of the Potomac, to June 1864. 3rd Brigade, 2nd Division, X Corps, to December 1864. 3rd Brigade, 2nd Division, XXIV Corps, to March 1865. 3rd Brigade, 2nd Division, X Corps, Department of North Carolina, to August 1865. 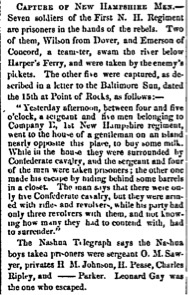 The 4th New Hampshire Infantry mustered out of service August 23, 1865. Enclosed you will find $75. Fifty from me & twenty-five from Alonzo [Gay]. We are well & having a pleasant time. Again I sit down to let you know that I am well and hope this may find you all enjoying the same blessing. I got over my sickness in good shape but it was my good luck for they all pronounced me damned sick. We are making preparations for a forward movement. Everything is sent to Norfolk. I have sent my trunk to you. You will pay the Express and let me know how much it is and I will send it to you. I couldn’t pay it here as it had to go to Fortress Monroe before there is an Express Agent. You will open the trunk for there is a package for Mrs. Gray. You must write about every week for I don’t expect to get a chance to write very often as we will be on the move all the time. The 10th and 13th are across the river in Yorktown. I am in hopes to see Joe Carter ¹ in a day or two. You must excuse this poor writing for I don’t have much time to write. I will close. My love to all and a share yourself. In haste. 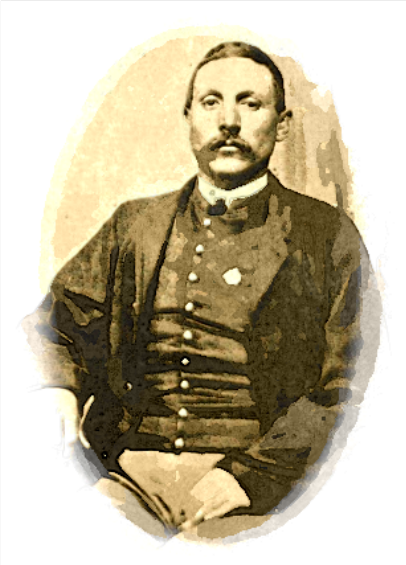 ¹ Joseph Carter, Jr. of Nashua enlisted on 23 July 1862 in the 10th New Hampshire Infantry. I have just received yours of May 8th and was much surprised to learn that you had not got my letter that I wrote to you for the clothing as I have been looking for them every day for a week past. I wanted you to get me a sack coat, pants, & vest made. I left my measure with J. B. Chapman & Co. I wanted them made out of their finest cloth. I also wanted you to get the money of Maria to pay for them as I only got one months pay when I got paid off. If you can get the clothing made and send them to me by the first of June, you may send then and if not let me know with out a moment’s delay for I have been so hard up for clothing since I have been in the service as I am now. The letter that I sent for the clothing I wrote the 22d of April and as I thought sure that I would get the articles that I sent for by this time. Inclosed you will find $90 for which you will dispose of as follows. Take out what I owe you and take the rest of it to get the following articles — one vest chain, 1 pr. gauntlet gloves, a vest that I spoke to you about in one of my letters, one pair boots (no. 7) and you can send those that I sent home for John Nichols. One razor for shears to cut hair with. Thodse shirts in my trunk you will send also. You will send the box to Col. Louis Bell, 3rd Brigade, 2d Division, 10th Army Corps, via Fortress Monroe, Va.
You will not put any eatables in the box for fear it will spoil. I wish you would send it as soon as you can get the vest made. I have a half of a two dollar bill that I will send you and if it don’t pass you must not blame me. If there is any more than enough to get the articles, you can give the rest to Ann. If not enough, let me know and I will send it to you. You will put a letter in the box so that the Col. will know who it is for. Put the directions on plain and so it won’t rub off. I have not time to write any more as we are to have a review this afternoon. Camp 4th Regt. N. H. Vols. I now seat myself to answer your kind letter which I received in due season but am sorry to say in reply that my health is not very good at present but I am on the gain. I was quite sick for about a week. I came near having a fever but he Surgeon broke it up for me. You spoke about my coming home to vote. I don’t think that you need to look for me again until my time is out unless I get wounded or I am taken sick so as to have to go to the hospital but I hope that I shall be able to escape both wounds & sickness for neither of them are very agreeable. But I must take my chance with the rest. I think I have been very lucky thus far for there is not many that has escaped as well as I have. I am getting rather ragged. I think I shall have to send home for some clothing before long if we get paid off but there is not much sign of getting paid at present. You said that Charlie was not at home. Did he send those shoes that he got for me? I have never received them! If he has not sent them, I wish he would for Charles Gay writes for them every time he writes to me. By the by, I would like to have Charlie send me as soon as possible a pair of No. 7 heavy calf boots by mail and I will send him the money as soon as we get paid for I can’t get a pair here short of sixteen dollars. I think they can be done up with the ends open so the postage will be less than two dollars. I would like him to send them as soon as you get this letter for the ones that I have is about played out. They have been a paroling our prisoners ¹ for the past few days. They are a hard looking set. They are ragged and almost starved to death. They must have suffered very much. I never saw such a sight in my life. I don’t think of anything more to write about — only this letter I have to borrow the stamp to put on it. I would be very happy to have some sent to me for there is none to be had here. Love to Ann & Maria & all the folks. You also will accept the same. Hoping this may find you all well. As I have received the clothing that I sent for I thought I would write you a few lines to let you know how I liked them. They are just what I wanted and fit well — all but the vest. That is a little full across the breast. I wrote to you not to get them made but I am glad that you sent them now for when I wrote that letter I had sent in my resignation but it was not accepted so I have got to stay a while longer. But I don’t intend to a great while longer for I intend to shove in my papers again in a few days but not until I get a sure thing on going out. Those handkerchiefs are nice ones. I suppose that Ann sent them as I sent to her for them. This morning was the first time that I have had on my suit and I tell you I come out on inspection a shining. I looked as well as the best of them. But I have been looking damned rough for a spell back. By the bye, Joe Reaver ¹ was here a few days ago to see me. He has been a prisoner since last September. He was at Salisbury, North Carolina while in prison but he is now on his way to join his regiment. He was looking tip top. I have not received any letter yet so I am not able to learn what my clothing cost me but I suppose I shall get a letter from you before you get this. Well, I don’t think of anything else to write this time and my pen is damned poor so I think I will close, hoping this may find you all well. ¹ I have not been able to identify a POW by the name of Joe Reaver so perhaps the name is spelled incorrectly. He was probably not a member of the 4th New Hampshire but likely to be from the vicinity of Nashua, New Hampshire. Camp 4th New Hampshire Vols. I have just received yours of the 30th and as I have nothing else to do I thought I would try and answer it. My health is tip top and I don’t have but a little to do but still I am not contented for I want to get out of the service but I think I shall stay as long as the regiment does which I am in hopes will be this fall but we may not get out until next spring but I won’t mind it much if we don’t if I am content myself, but I am rather homesick now as there is nothing to occupy my time . I would rather stay here until spring than not if I could content myself but there is but little going on here. There is to be a trot this afternoon between two horses of our regiment — a two mile heat best two in three to saddle. I think it will be a slim affair as one of the horses was taken sick this morning. I suppose before you get this you will see the boys that has been discharged from my company who is Berry, Montgomery, & another one that you did not know. I was owing [Albert C.] Berry & [Francis W.] Montgomery twenty-five dollars each and I told them that I thought that Jim Wright would cash them for them [and] if he would not, to take them to you. They would discount five dollars on them. Well how is all the boys in Nashua and how does the returned soldiers behave? I suppose they will be rather ruff until their money is gone. What is Joe Carter doing since he got back? He is the same old Joe. The last time I saw him he had not altered a might from what he was before the war. I don’t think of anything more to write about this time so I will close wishing you all pleasant dreams. I remain as ever yours, &c &c. — Leonard A. Gay, 1st Lt., 4th N. H. V.
This entry was posted on Saturday, August 30th, 2014 at 8:10 pm	and posted in Uncategorized. You can follow any responses to this entry through the RSS 2.0 feed.